Birkbeck PhD student and relationship writer Suzi Godson co-founded the mental health-support app MeeTwo. Now she is busy raising funds through a Kickstarter campaign to create a MeeTwo magazine – containing stories, art, photography, poetry and more – for distribution to schools to provide further help to teenagers in need. Here she explains more about the project. Research shows that half of all adult mental health issues manifest by the age of 14 and the average age for the onset of clinical anxiety is just eight years old. One in five young people will experience a mental health issue in any given year and suicide is now the leading cause of death in young people. These figures are rolled out time and again to emphasise the dire state of teenage mental health in the UK, but the voice of teenagers themselves is rarely heard. Two years ago, I represented Birkbeck in the Santander Universities Entrepreneur Awards with my idea for an app that would make it easier for teenagers to talk about difficult things. In September I launched the MeeTwo app and it is now a thriving community of 2,500 teenagers who have lots to say on the subject of mental health. I decided it was time to give them that voice so I am using Kickstarter to crowdfund the printing and distribution of The MeeTwo Mental Help Handbook For Teenagers. It’s essentially a collection of very moving first person accounts from young people who are coping with a range of issues including more serious mental health issues. The clever thing about the handbook is that it also contains a turbo-charged directory that goes way beyond the usual list of helplines. As well as listing support groups and helplines, the Mental Help directory details the best apps, the best TedX talks, books, self-help, activities and products to enable young people to help themselves. It’s much needed because 61% of GP referrals to the Child and Adolescent Mental Health Services are rejected because the criteria for acceptance are so high. That’s a scandal in itself so the handbook also provides a unique opportunity to ask experts why teenage mental health is such a big problem. We’ve pulled in some big names to help us answer this question. Professor Sir Simon Wessely, President of the Royal Society of Medicine, Regius Professor Of Psychiatry at King’s College, London and all-round boffin has given us a dynamite interview. And we will be announcing more big name contributors soon. 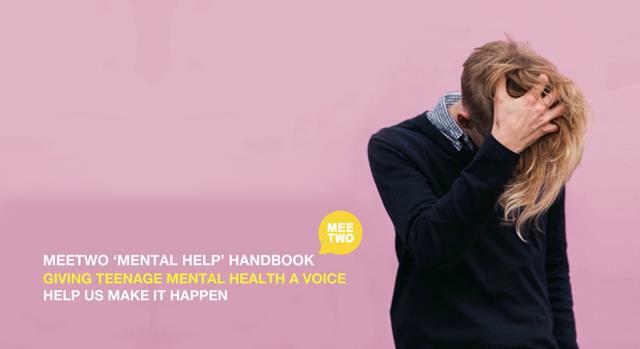 The MeeTwo Mental Help Handbook is going to be a fantastic resource for schools, for young people and, indeed, for anyone studying psychology, social care, or education. However, we have to reach our Kickstarter target of £10k in order to be able to print and distribute it. We are half way there but Kickstarter is an all-or-nothing funding platform, so please buy a copy (£10) of the handbook here and tell everyone you know to do the same. Help us to make it happen. Category: Uncategorized Tags: app, birkbeck, MeeTwo, mental health, Suzi Godson, teenager by Anthony.